I’ll admit to it. I’m often looking for images to use as wallpapers for my desktop. I guess I have a bit of desktop ADD. I don’t like looking at the same images over and over and am always looking for something new and close to me. There are many times where I see a suitable subject and photograph it, with the sole intention of creating a desktop wallpaper for myself. This past week I went for a walk along my favourite local hiking trail and the poplars were just dropping their leaves after a hard frost. There were a few ‘interesting’ leaves laying on the trail and a few stuck to logs along the way. I stopped to make photos of a many of them. I liked the composition of this particular image and began to process it, only to be totally surprised at all the colours present in the fallen leaf. Really, there is purple and fuschia in this? I was seeing only the greens and yellows when I made the image. Nature is truly amazing, especially when you take the time to look closer. I consider myself as an observer, but every now and then, the unexpected shows itself, as in this photo. I challenge all of you to get out there and observe. New perspective are in store and your assumptions of what is considered obvious, may be challenged. 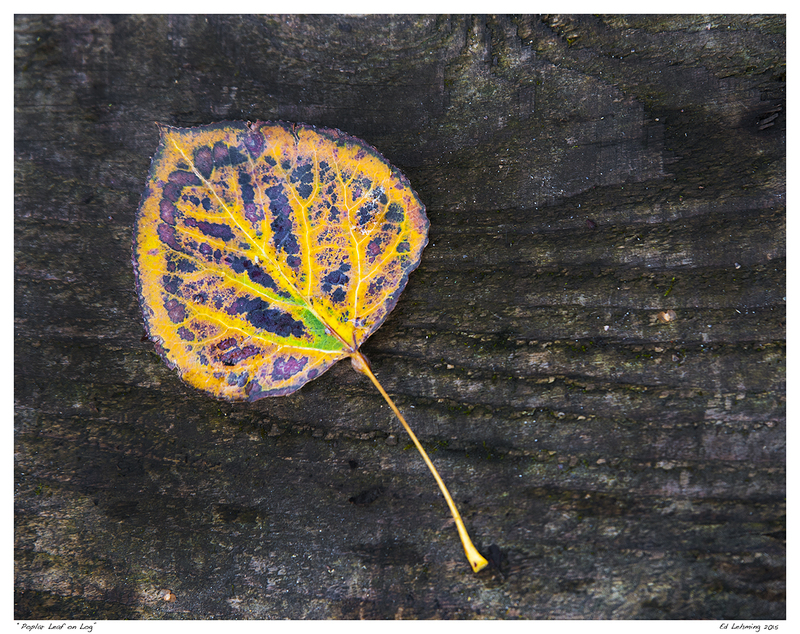 This entry was posted in Photography and tagged Colour, detail, fuschia, hike, leaf, Nature, observe, ontario, poplar, purple, unexpected, Uxbridge, wallpaper on October 21, 2015 by Ed Lehming Photography. One of the wonders of photography, that I have noted before, is the fact that I can walk past a scene dozens of times and nothing ‘grabs’ me. 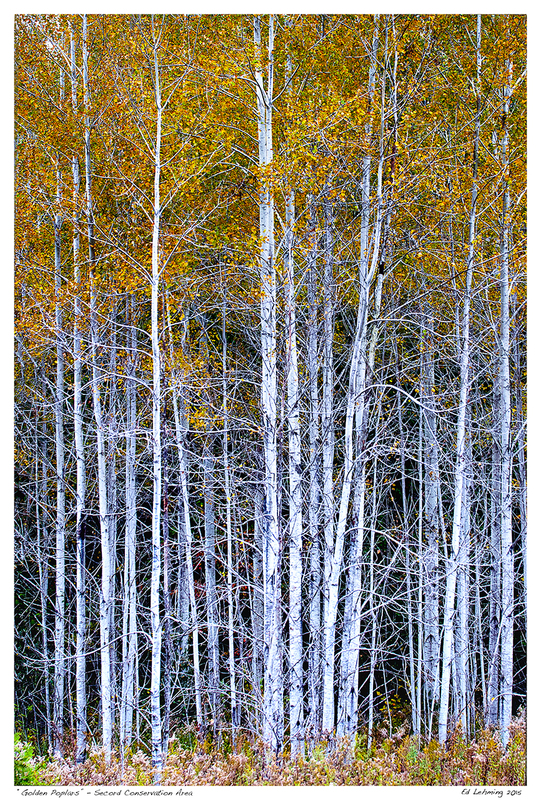 In this case, there is a nice stand of poplars along one of my favourite hiking trails. I’ve photographed it many times and the results were “average”. I knew it had potential for a great photo, but conditions and lighting were never quite right to capture the photo I envisioned. That was not the case last Sunday. On this particular hike, all the elements came together; the light, the colour of the leaves, the reflection of the bark, as well as the angle I was photographing from. I carefully framed the shot to match my vision of the image, checked and double checked my camera setting, and made one single photograph ( a big risk there). I deliberately underexposed it, since I knew the tree bark could blow out some sections (I learned this through previous attempts). When I got home and downloaded the images from my camera, I knew I had what I’ve been seeking. With only minor adjustments to compensate for the under exposure and a bit of sharpening, the image above emerged. It was all I had dreamt of. I also printed it as a 12×18 print and it now hangs proudly in my home gallery, where I can enjoy it as I work. I hope you enjoy it too! This entry was posted in Photography and tagged Art, autumn, Canada, colours, conservation, fall, finally, glow, gold, hike, image, Nature, ontario, poplar, print, proud, trail, Tree, underexposed, Uxbridge on October 20, 2015 by Ed Lehming Photography. It’s fall. Time for me to get out into the woods and just enjoy being there. It’s been a late fall here and the temperature is still mild, considering the time of year. We’ve been visited by a few flurries and light frosts till last night. The colours are spectacular and trees slow to shed their leaves. Essentially, ideal fall conditions for photography and just enjoying nature, in all its glory. I took a lunchtime stroll today and was surprised at how much colour was still present, despite our first real hard frost last night. I noticed a lot of leaves coming down and figured this might be my last chance to capture and share this beauty. One of my go-to places is the local Secord Conservation area, just south of Uxbridge, Ontario. The trail winds its way through variable southern Ontario forest. Through groves of oak, maple, poplar, maple, cedar and spruce. There are meadows and swamps, high ridges and rolling hills. The Oak Ridges Trail Association does an amazing job at maintaining these trails, which I enjoy in all seasons. 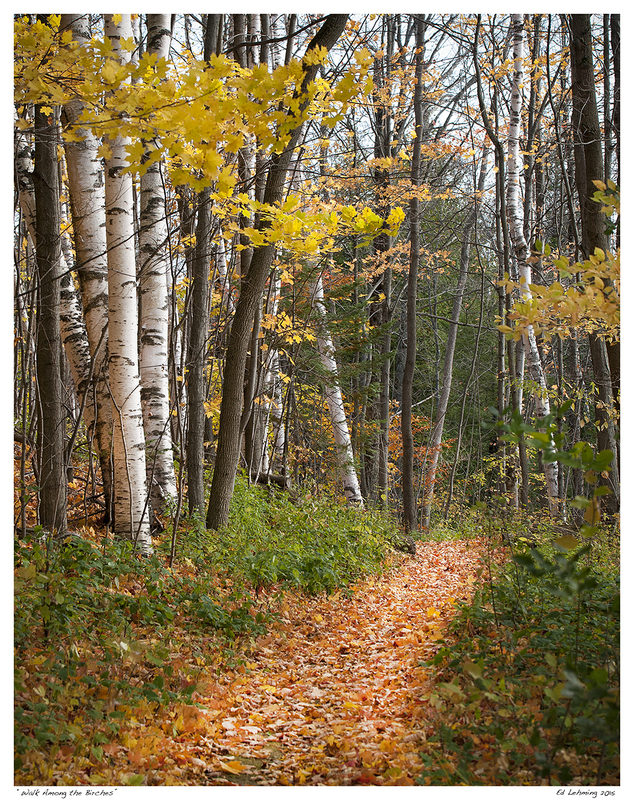 I could not resist photographing this stand of birch trees next to the golden leaf-covered trail. The sun was bright with interspersed clouds, which made for great lighting conditions. I hope you enjoy my view of this walk as much as I do. More to come. 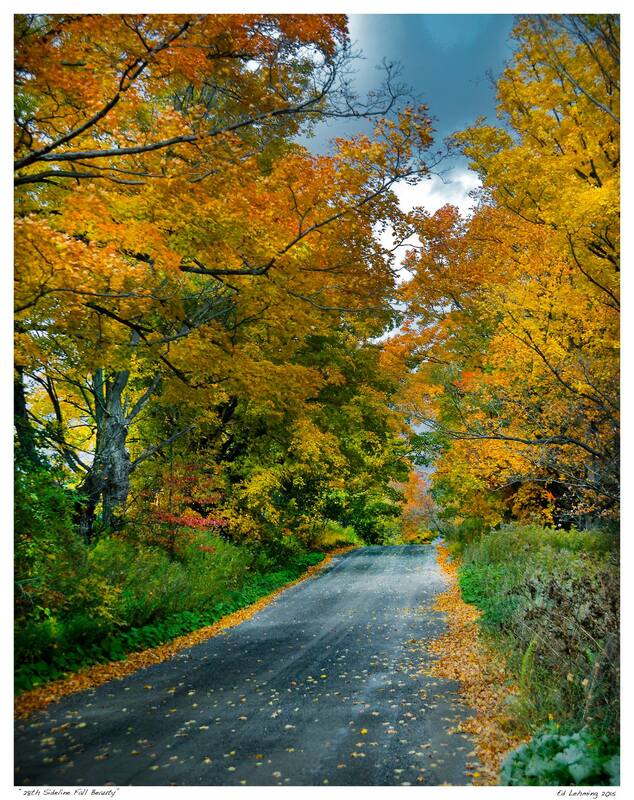 This entry was posted in Photography and tagged autumn, beauty, birch, Colour, fall, forest, gold, hike, leaves, moraine, Nature, Oak Ridges, ontario, ORTA, outdoors, Secord, Uxbridge on October 19, 2015 by Ed Lehming Photography.